On Sunday, Nov. 4, Radha Kalachandji Hare Krishna Temple is celebrating Govardhana Puja (Cake Mountain Festival) and Diwali. Govardhan Puja is one of the favorite festivals on the calendar. It commemorates a remarkable story from the ancient scriptures of India where Lord Krishna protected the inhabitants of a village from torrents of rain by holding a mountain named Govardhan over them for seven days. Diwali, meaning the festival of candlelights, marks the Hindu New Year. Diwali originates in the epic Ramayana when Lord Rama (an incarnation of Krishna) returns to his kingdom after defeating the evil tyrannical king Ravana. The celebration is from 4-9 p.m. Admission is free. The evening will start with kirtan (singing of the Lord’s names to music). During the kirtan, there will also be a kind of ablution ceremony called abhisheka in which the Deities are bathed with a variety of auspicious liquids. The centerpiece of the festival is a 15-foot long edible replica of this mountain, called Govardhan Hill. The cake mountain is exquisitely decorated with sweets, lakes of pudding and ornamental mini Indian temples. 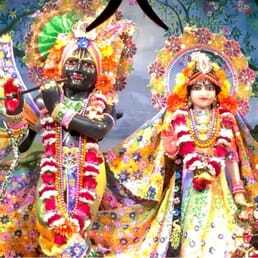 Accompanying it are ornately decorated and hand painted dolls depicting Krishna, and the villagers. Surrounding the cake will be 1,008 other delicious sweet and savory food preparations made by Hare Krishna devotees. Afterwards a multi-course free vegetarian feast will be served. Then there is more kirtan in the temple, which is illuminated by thousands of candles. It is a stunning sight that only happens once a year. Everyone present will have the opportunity to offer a candle. Come light a Diwali candle for peace!